Firefighters battle large industrial fire in Port Colborne, Ont. 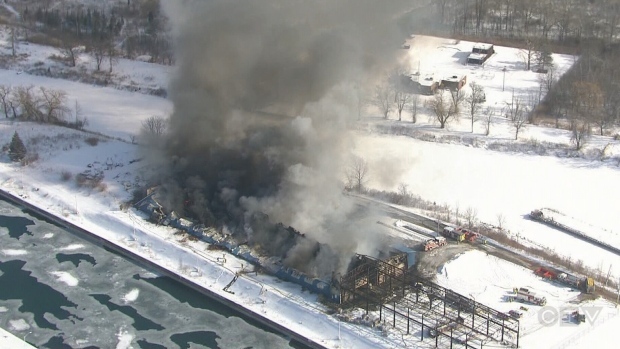 Dozens of firefighters battled a large industrial blaze in southwestern Ontario on Tuesday, drilling through the ice of a nearby canal at one point to get enough water to fight the flames, local authorities said. The fire in Port Colborne, Ont., -- in which authorities said no one was injured -- broke out at a facility that manufactured vinyl products and sent plumes of thick black smoke into the sky that were seen by residents across the border in the United States, about 30 kilometres away. The municipality advised area residents to stay inside with their windows and doors closed as the Environment Ministry conducted air quality testing. The City of Port Colborne noted, however, that tests of three locations by Tuesday afternoon had reported the air quality as safe. The blaze at Vinyl Works Canada was reported around 7:40 a.m. by workers who had arrived to open up the building, the local fire department said. Seven workers were in the facility at the time and left safety, authorities said. "The flames were going up the wall, coming out of the roof. It was really involved. It had a good head start before we got here," Deputy Fire Chief Mike Bendia told reporters, noting that the fire caused the structure to collapse entirely. 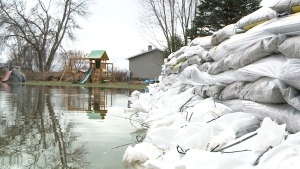 Water to fight the blaze was brought in by neighbouring fire departments for hours until crews were able to drill through the ice that covered the nearby Welland Canal, he said. There were concerns about the smoke from the fire leaching toxic chemicals into the air Bendia said, but crews fighting the flames took precautions. "It's very toxic smoke. Any firefighter that was in what we consider the 'hot zone' was wearing a self-contained breathing apparatus and full protective equipment," Bendia said, noting that the wind lifted the smoke up and away. "Had it been coming the other way we would have had a serious problem," he said, adding that none of the debris from the fire got into the nearby canal. By about 2 p.m., crews had mostly fought the fire back, Bendia said, and they were preparing to bring heavy equipment into the wreckage to stamp out the rest of the flames -- a labour intensive process. "I estimate we will probably still be here tomorrow afternoon at this time," he said. Bendia said the help of other fire departments was key to bringing the blaze under control. "Every department in the region contributed something to this. We had tankers, pumpers, ladder trucks from all over," he said. "This is definitely the biggest fire -- with regards to the most involvement from multiple departments across the region -- that I've been involved in. And I've been in the fire service for about 38 years. This is huge, where almost every department in the region participated." Ontario's Office of the Fire Marshal will be investigating. 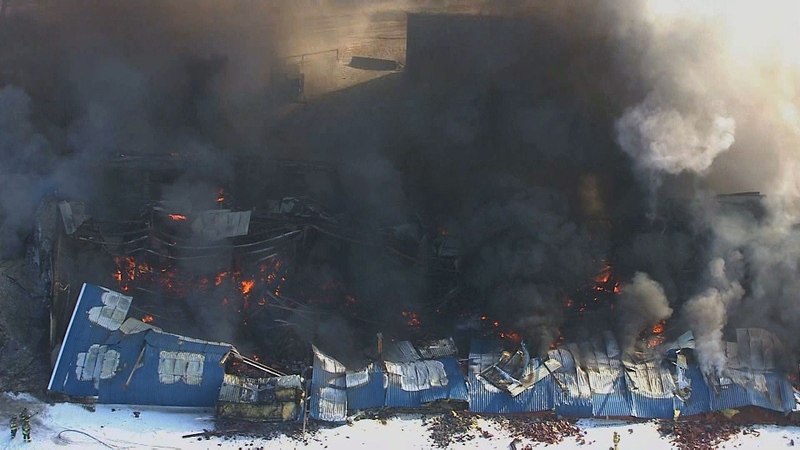 Firefighters are battling a six-alarm blaze at an industrial building in Port Colborne, Ont. 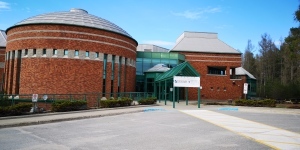 Fifty-one layoff or redundancy notices were handed out to Simcoe County high school teachers on Thursday.